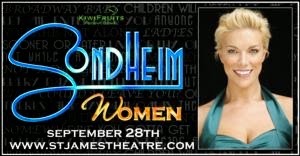 KiwiFruits Productions are returning to the St James Theatre this Saturday, 28th September with their second series of 'SONDHEIM: Women' celebrating over five decades of the great anthems of Broadway composer and lyricist Stephen Sondheim. Three time Olivier Award nominee and WhatsOnStage Award winner Hannah Waddingham, two time Olivier nominee Josefina Gabrielle, and two time Olivier nominee Emma Williams headline a cast of West End leading ladies. They will be joined by Jamie Birkett, Zoë Curlett, Rebecca Lock, Fiona O'Carroll, Lauren Samuels and Lucy Williamson.